I – The Government of Egypt. with the Egyptian Natural Gas Holding Company (EGAS) as the implementing agency, has applied for financing from the world Bank and the Agence Francaise de Development (AFD) toward the cost of Household Natural Gas Connection Project, and it intends to apply part of the proceeds of this loan toward payments under the A/M Contracts. 4- Interested eligible bidders may obtain further information and inspect the bidding documents from Town Gas; Materials Dept. during office hours 8.00 am to 3.00 pm. at the address given below. 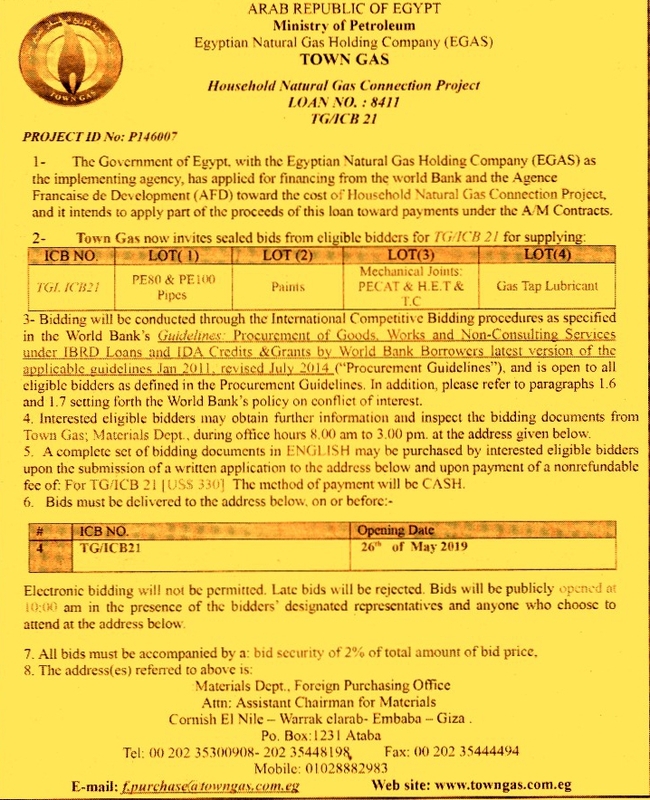 5- A complete set of bidding documents in ENGLISH may be purchased by interested eligible bidders upon the submission of a written application to the address below and upon payment of a nonrefundable fee of: For IG/IC’B2[US$330], the method of payment will be CASH. Electronic bidding will not be permitted, late bids will be rejected. Bids will be publicly opened at 10:00 am in the presence of the bidders designated representatives and anyone who choose to attend at the address below.